Dr. Paul Lucey looks at an image similar to the ones he hopes to collect from a camera scheduled to be placed on the International Space Station. This space surveillance system will photograph coral reefs around the world. University of Hawaii scientists hope to have a camera on the International Space Station by December 2004 to begin mapping the world's coral reefs. In a study on the project for NASA, the scientists concluded that in a year they could produce a map of the abundance of living coral for every known reef in the world, said Paul Lucey in the Hawaii Institute of Geophysics and Planetology, School of Ocean, Earth Science and Technology. "This is pretty revolutionary," he said, explaining there are about 500,000 square kilometers of reef in the world, and only 10 to 20 square kilometers have had detailed study. "Measuring the total aerial abundance of coral in the world is like finally knowing how many trees are in the forest," he said. Lucey, a planetary scientist, and Marlin Atkinson, Hawaii Institute of Marine Biology professor who studies coral reef biogeochemistry, have been working on the project for about seven years as partners. 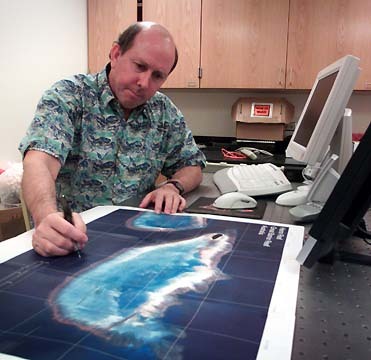 Lucey said he saw the potential of mapping coral reefs from the air after hearing Atkinson describe the discovery by one of his students that coral has a unique spectral signature or color. Atkinson said he and Eric Hochberg, now a post-doctoral researcher, were looking at airborne images of Kaneohe Bay in 1995 and identified a wave band in the blue light that distinguishes corals from algae on the sea bottom. At that time, there were only 20 published measurements on how light reflects off the bottom on coral reefs, Atkinson said. He said Hochberg, then working on a master's degree, and a couple of other students went to all the best dive spots in the world and got 20,000 measurements confirming the unique spectral band in corals. Atkinson said his group has researched how light moves through water on the reefs and knows a lot about how different bottoms reflect light. "We're trying to apply fundamental knowledge to truly be able to identify coral from space. ... If we get the same coverage we're expecting -- a good 78 percent of coral reefs in the world -- it would be fantastic." While their goal is to do coral reef measurements, they're also getting UH involved in building space hardware, Lucey said. Collaborating on the project are the Hawaii Institute for Astronomy, the Naval Research Laboratory, Utah State Space Dynamics Laboratory and NovaSol, a local firm. Lucey said the Navy has already built a camera for the space station and UH will build an engineering model and its pointing system. The UH and NovaSol also will build an infrared camera for the space station to monitor natural hazards on Earth such as volcanoes and fires, he said. NovaSol will produce a spectrometer and the Institute for Astronomy will build the infrared detector. "I'm really excited about this because it is another beautiful example about the interdisciplinary synergys we have at this institution," said IFA Director Rolf-Peter Kudritzki. The Rockwell Co. will develop basic technology for producing chips and IFA scientists will do all the electronics and testing of chips, he said. The Institute for Astronomy has worked for more than a decade on infrared detectors, which will also be used on the next-generation space telescope, Kudritzki said. "We're really proud of this development," he said, noting that whenever visual and infrared light detectors are used in astronomy all over the world, they're called "Hawaii detectors." Lucey said most of the data from the space station camera will be returned on discs by astronauts, but he also expects to get a large amount of live data. He said funding for a space operating center to receive real-time data has been tentatively approved by Manoa Chancellor Peter Englert. It would be located near his office in the Pacific Ocean Science and Technology building. Atkinson said his group, working at the marine laboratory on Coconut Island, will receive some data and focus on images of coral reefs. They want to be able to identify coral in the background of different types of bottoms, he said. One of the big questions is the worldwide distribution of coral and algae. NASA awarded Lucey and Atkinson $300,000 three years ago to compete for $15 million to develop a camera for the space station to map and assess the health of coral reefs. The project faltered when NASA canceled all university space hardware projects, Lucey said. Then, about eight months ago, he got together with Curtiss Davis, a friend at the Naval Research Lab with a similar system. The UH scientists went to U.S. Sen. Daniel Inouye for funding to participate in the Navy's Hygeia project, and $2 million has been budgeted for it by the Department of Defense, Lucey said. UH planetary scientists have participated in many space projects over the years, he said, but they haven't built anything for space work. "The $2 million is considered seed funding to get UH into the space game," Lucey said. The Navy's interest is to test spectral techniques to map shallow ocean depths for support of amphibious warfare, he said. It plans to map 10 sites from the space station, with divers measuring the depth of the water to prove the concept for use on a satellite, he said. Kaneohe Bay will be added as a test site because it has been well studied, he said. When the Navy isn't using the camera, it will automatically take pictures of the coral reefs, Lucey said. Atkinson, Hochberg and students will go to sites around the world to validate findings from the space images. Atkinson also hopes to find a ship working in tropical environments that his team could use as "a ground truth boat." He said the coral reef mapping program has wide support from NASA and the National Oceanic and Atmospheric Administration and Inouye is excited about it. Hopefully, the project will lead to a platform in space dedicated to mapping coastal environments, he said, pointing out coral reefs comprise just one type of ecosystem scientists are interested in.